Former Australian international Herbert "Paddy" Moran has been inducted to the Wallabies hall of fame, 100 years after he captained the side on their tour of the UK. Moran is the first of three Wallabies to be inducted this year and is their pre-Second World War representative, with the two post-War inductees being named following the Tri-Nations Tests against South Africa in Sydney on 23 July and the All Blacks in Brisbane on 27 August. A flanker with the Sydney University club, Moran was chosen to lead the national team's first European assignment in 1908-09, with the trip including Test matches against Wales and England and a gold-medal winning performance at the London Olympics. Moran had never played for Australia before the tour, made only the one Test appearance against Wales due to injury, and turned exclusively to his medical career after the Wallabies trip, bringing an end to his rugby career. However, Moran provided Australian Rugby with a significant and lasting legacy as the first captain of a European tour. It was Moran who railed against the British press who, while the Australian team was en route to England, had taken to calling them "The Rabbits". According to the captain in a letter home, there was no way the Australians were going to wear the name of a pest that bred in plague proportions and to have that name foisted on them by the British. On board the ship that carried them to Britain, the Wallabies discussed an alternative to "Rabbits". In Viewless Winds, one of the three books he had published, Moran wrote: "Wallabies, Kangaroos, Kookaburras and Wallaroos (had earlier been) suggested. The position demanded a conference. All were agreed that any name would be preferable to Rabbits. Wallabies won by a couple of votes." Moran captained the Wallabies in their first eight games of the tour, and they lost just one, against Welsh club Llanelli. In the last of those eight he dislocated his left shoulder but remained on the field and continued to play with his arm strapped to his side. The injury forced him to miss the Olympic gold medal match against English county Cornwall, with the Games decider the only match the Wallabies had to play to claim the Olympic title. The injury forced him out of the England Test, won 9-3 by the Wallabies. Moran captained the Wallabies 16 times in all during the tour. He stayed on in the UK to further his medical studies, returned to Australia in 1910 to set up a practice, and at the outbreak of the First World War sailed to London to offer his services. He was made a Lieutenant in the Royal Army Medical Corps and served in Gallipoli. 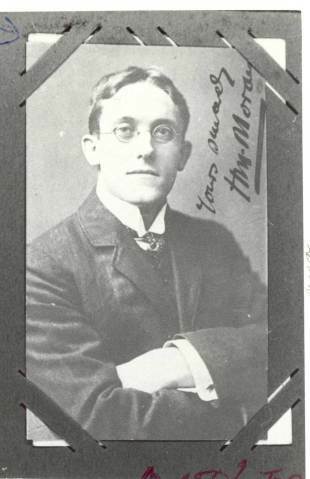 Moran died in 1945. Moran is the 21st inductee to the Wallaby Hall of Fame and follows another forward from the 1908-09 tour, Tom Richards, in receiving the recognition. The 2010 Hall of Fame inductees were A.C. Johnnie Wallace, Trevor Allan and Andrew Slack.